On Crooked Knees: Dig In! Dig in! Dig in! 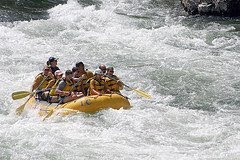 Suddenly the waters turned into a whirlpool and the six of us thrust our paddles into the water feeling our weakness against the river’s strength. Nevertheless, our rafting guide repeatedly yelled, Dig in! We listened. Digging in was what had to be done in order to get through to the other side. My muscles ached the next day as a result of digging in. At one point I felt myself being pushed off the raft by the force of the water; I dug in deeper. Digging in was the critical element of survival, but it also helped stave off fear. When one is busy digging in there isn’t time for fear. It would be nice if there was a river guide yelling Dig In! when our life river suddenly turned to rapids. Too often fear overcomes us and forgetting to dig in we become swamped by circumstances beyond our control. We feel our weakness. But the truth is that we do have a river guide daily encouraging us to Dig in! Abraham and Sarah grieved over their infertility and God said, "Your descendants will outnumber the stars"–Dig in! When Job was put to the test, God said, "who hung the stars in place"–Dig In! Gabriel tells Mary, "Don’t be afraid. God is with you"–Dig in! In the moment of life’s turbulence, if we are willing to listen, our heavenly River Guide can be heard to say, "You have nothing to fear. I am with you." Dig in! your love and the Holy Spirit’s guidance. Valerie - how timely are your words this morning to "Dig In"! My cousin's husband has a lesion on his pancreas & we won't hear about the results until next week. Oh waiting! So I've forwarded your blog to family members so we can indeed "dig in" & look upward for our strength! Currently digging in here to get through the present rapids and yes! it does take your mind off being swept downstream. Yes, it builds faith!